Portland Conservatory of Music is pleased to present group classes designed specifically for home-school students. Below is a sampling of classes we offer which can be tailored to meet the needs of each homeschool group. For more information or to discuss the specifics of what your students need, please contact PCM Executive Director Jean Murachanian, at director@portlandconservatoryofmusic.org. All classes are 90 minutes long, with each course meeting for 6-10 weeks. Tuition is $25 per person for each class meeting. This class has three different components: Part 1 – Music Appreciation, Part 2 – Music Essentials (Theory), and Part 3 – Musical Instruments (hands-on). In this class students will have fun exploring many different aspects of music in an interactive and exciting way as we bring famous composers to life and discuss their music. Students will get to play the parts in different operas and musical dramas and sometimes even have a personal encounter with a composer. The class will include basic music essentials, which is largely an introduction to music theory. Students will get hands-on experience playing various musical instruments, giving them an opportunity to perhaps find their instrument. The class is designed to keep the students actively involved in music and instill a love and appreciation for music while having a lot of fun! This class has three different components: Part 1 – Music Appreciation, looks at the lives and works of composers from different musical genres including classical, jazz, rock and roll, and even musical theater. Part 2 – Music Essentials teaches basic music theory, so students can better appreciate how music works and even write their own music. Part 3 – Musical Instruments, teaches students how to read music, play musical instruments, and learn how to play with others. The final class will be a performance by the students for their parents. Have you wanted to explore your musical talent and find your instrument? Each week, this class will be taught by a different one of our talented instructors as they explore the intricacies of their instrument of choice. Range of instruments may include: piano, voice, guitar, violin, cello, trumpet, saxophone, clarinet, flute, and harp! This is a unique opportunity to find the instrument best suited to your personality and enjoy a life filled with music. The ukulele is now more popular than ever before and very affordable. This versatile instrument is no longer just for Hawaiian music. It’s used for rock, jazz, classical, folk and even heavy metal. Learn to play chords and tunes, while also being introduced to tablature and music sight reading. Students need to provide their own ukulele. The teacher will help with the selection of an instrument and any necessary instruction books. If you’ve always wanted to learn guitar but never got around to it, here’s your chance! This class will introduce you to the basic techniques of playing guitar, in a relaxed setting. Individual instruction will be provided as needed for each student. Chords, popular songs, and sight reading music will all be covered in the class. Students need to bring their own guitar. The teacher will help with the selection of an instrument and any necessary instruction books. This class has three different components: Part 1 – Music Appreciation, Part 2 – Music Essentials (Theory), and Part 3 – Musical Instruments (hands-on). In this class students will have fun exploring many different aspects of music in an interactive and exciting way as we bring famous composers to life and discuss their music. Students will get to play the parts in different operas and musical dramas and sometimes even have a personal encounter with a composer. 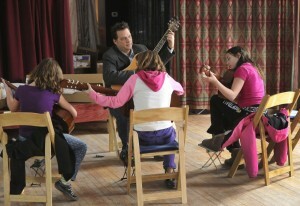 The class will include basic music essentials, which is largely an introduction to music theory. Students will get hands-on experience playing various musical instruments, giving them an opportunity to take part in making music. The class is designed to keep the students actively involved in music and instill a love and appreciation for music while having a lot of fun!